Top-Rated Arizona Business Lawyers, A+ on BBB‎ | Denton Peterson, P.C. Skilled Professionals. Personal Service. Exceptional Results. From the moment I first contacted Denton Peterson, I have been consistently impressed with their courtesy, skill, and professionalism. I would recommend Brad Denton to anyone. He is extremely knowledgeable in matters of the law and he proved to me that he is honest and reasonable as well. In my interactions with Mr. Denton he was always concise, well prepared, and most importantly kind. His preparation, knowledge, and experience as a litigator proved invaluable in every aspect of my case. I would recommend him and his firm to anyone who is in need of an excellent and tough attorney. I would be happy to share my experience in more detail as a reference to anyone considering this firm. I found myself on the wrong end of a lawsuit. . . . Sterling handled my claim and to be honest I am so happy he did. Within weeks we had a settlement offer . . . . I am thrilled with his ability to see through the facts of a claim and relay that to his opposing counsel and effectuate a settlement . . . I cannot say enough good things about Sterling. He is personable, approachable, knowledgeable, funny, and talented as a lawyer. . . . . I highly recommend him as a lawyer and his firm is great, they give their time and do not just give you time you are paying for but had contact both on an amicable (human) basis, as well as great legal communication. At Denton Peterson our first priority is your success. We help with litigation and trials. We are experienced and highly successful litigators. Our Mesa Arizona litigation lawyers have handled all kinds of business litigation matters, including commercial litigation, breach of contract disputes (including partnership disputes, employment disputes and payment disputes), infringement of intellectual property litigation (such as copyright and trademark lawsuits) and many other types of business litigation. We help with franchise law. We are experienced franchise law attorneys in Mesa Arizona, having represented many clients with putting together and reviewing franchise disclosure documents. We also assist with the purchase and sale of franchises. 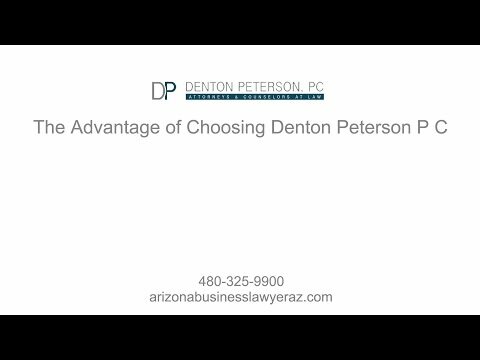 Whether you are looking to acquire legal counsel for your franchise in Arizona, or want to franchise your business, Denton Peterson has the legal expertise you need to successfully operate in the complex realm of franchise law. We help with business law matters. Our Mesa business lawyers handle many types of business law challenges that come up, including disputes between shareholders in a company, arguments between members in an LLC, partnership disputes and litigation, and handling the legal aspects of breaking up a business when necessary. This area includes agreements regarding the sale or purchase of stocks or shares, partner buyouts, asset purchase contracts, and so forth. We want to help you. Should you need assistance with these or other business legal issues, contact Denton Peterson today to schedule your consultation.